From orange to watermelon and dragon fruit, you'll definitely find something that matches your taste! REGIA Tutti Frutti Color not only looks tasty, it is also breathable and extra soft because of its high cotton content. REGIA PREMIUM Silk Color, is a 4-ply sock yarn made from a high-quality blend of merino wool and silk, which makes it wonderfully soft, shiny and temperature-compensating. REGIA Nautic Color was available in three different shades of blue in combination with white in six different effects. Just right for those who can’t get enough of classic combination blue and white. The refined stripe look comes directly out of the yarn ball in the well-known REGIA quality. 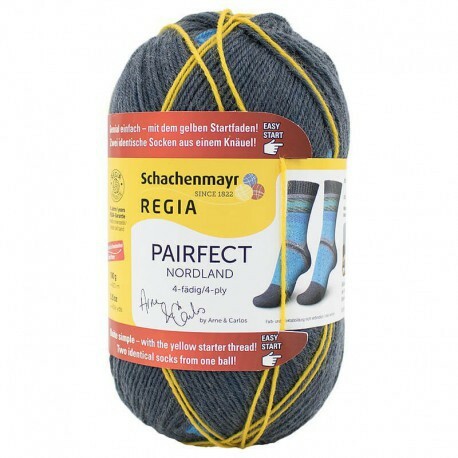 REGIA PAIRFECT Nordland – A new dimension in sock knitting! This innovation by REGIA makes it incredibly simple to knit two identical self-patterned socks from one skein.